As orthodontists, we’re always looking for ways to grow our practices and operate at full capacity. Whether implementing marketing and sales campaigns or physically renovating the practice, the goal is to increase our annual case starts. From my clinical experience, I believe we can also grow our practices by eliminating key barriers to patients who are starting orthodontic treatment and by being prepared for challenges that arise during treatment that may cause patients to become noncompliant or pause treatment all together. It should come as no surprise that I’ve listed length of treatment as the No. 1 barrier. Treatment duration isn’t a barrier just because patients want instant gratification—it’s also because often patients are looking to improve their smiles before a major event in their lives such as a graduation, wedding, school dance or even relocation. With these tight timelines in mind, they’re looking for orthodontists who offer solutions that result in faster treatment times and healthy, beautiful smiles. Patients shop around for various reasons, but I suspect one reason is that they’re searching for an orthodontist who presents an agreeable treatment plan with preferred mechanics. For example, patients may be told they have to be treated with braces when they prefer to be treated with aligners. Or they’re presented with only surgical options when they’re trying to avoid surgery. Because there is no exact science that dictates precisely when an aligner becomes passive during orthodontic treatment, tracking issues with aligner cases can pose major challenges. Lack of tracking can occur when aligners are not seated properly or when the teeth are not progressing with the movement programmed into an aligner. This causes discomfort and frustration to the patient and, clinically, the case is no longer progressing as predicted, which will likely call for multiple refinements and extended treatment time. All of these barriers culminate into one even larger challenge: keeping patients engaged and motivated throughout treatment. Motivated patients comply with their elastics and aligners as instructed by orthodontists, which will keep their treatments on schedule. The same cannot be said for patients who aren’t engaged or who don’t feel like their treatments are progressing fast enough. Recent innovations that apply low- pulsatile forces to orthodontics can help orthodontists overcome these barriers in a way that offers practical benefits to patients and clinical benefits to orthodontists. (The AcceleDent device, for example, is used for 20 minutes daily by orthodontic patients in either braces or aligners.) It’s important to look at the science of these forces to understand how a vibratory element can provide a comprehensive solution to the clinical and practical barriers that could prevent orthodontists from achieving practice growth. Low-pulsatile forces have also been shown in a randomized clinical trial to reduce discomfort during orthodontic treatment by as much as 71 percent.7 A trial indicated that AcceleDent significantly lowered overall pain and biting pain scores during the study’s four-month period. I’ve also seen this in my practice—patients who begin using the product a couple of weeks after they started treatment will often comment on how using the device has greatly reduced their pain. While I integrate low-pulsatile forces into both my braces cases and my clear aligner cases, there is a significant improvement in treatment progression and outcomes with aligners when vibration is applied. 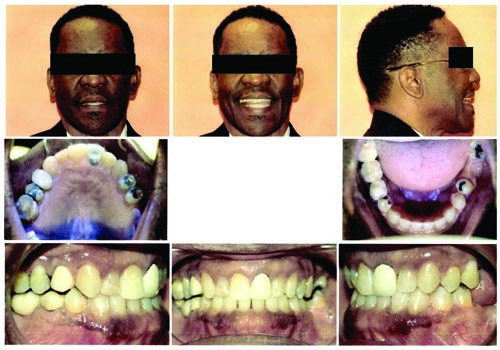 My cases track better and it enables me to treat more-difficult cases with aligners. It goes back to the science: By regulating the osteoclast activity, the teeth track more closely to the programmed movements into the aligners, eliminating gaps and spaces between the aligners and the teeth. Torque movements and rotations are expressed better in aligner treatment with low-pulsatile forces. This improved tracking means that I have fewer refinements, and very seldomly do I have to incorporate buttons or attachments. Delivery of the low-pulsatile forces is applied via a small, handheld rechargeable device that patients buy from the practice. Because they can use it wherever and whenever they choose, patients play an active role in their treatments. I believe that patient engagement leads to increased patient motivation and actually encourages them to maintain compliance with the 22-hours-a-day aligner protocol. The device also fosters high patient motivation because it enables them to change their aligners more frequently and they often report that they can tell or feel that their teeth are moving faster. My patients who are using AcceleDent are instructed to change their aligners every seven days or, if less tooth movement is required, every five days. All other patients are on a 14-day wear cycle. Sometimes innovation in orthodontics is created as a patient benefit, and other times innovation is for the sole purpose of creating clinical efficiencies. Based on my clinical experience of incorporating AcceleDent into my treatment plans for the past eight years, I know that it is one of those rare innovations that accomplish both objectives. 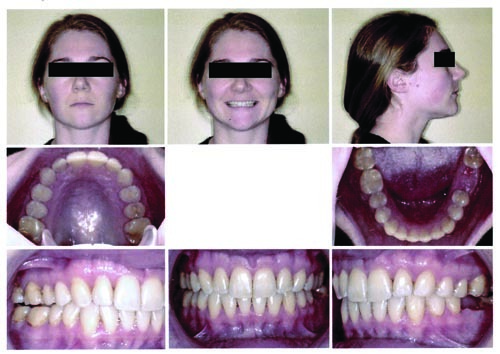 Orthodontists looking to eliminate common barriers to orthodontic treatment and challenges during treatment should examine the science behind low-pulsatile forces in orthodontics while studying real-world clinical cases. Using vibratory technology to stimulate bone remodeling is not a new science. When explaining AcceleDent to my patients or peers in the industry, I draw the comparison to the use of vibration technology in orthopedics.Pulsatile stimulation of bone has been studied since the mid-1980s and has been applied in practice to treat bone fractures and osteoporosis. The physiological response of vibration in orthopedics has resulted in increased rates of fracture healing and increased cellular signaling that enhances bone density. This is similar to what we’re doing in orthodontics with vibratory technology. When we move teeth from Point?A to Point?B, the bone has to break down and then builds back up. When applied to braces or aligners, low-pulsatile forces help stimulate that bone remodeling process so that teeth move faster, more comfortably and more predictably. A 26-year-old patient presented with an asymmetrical bite and a deviated lower midline. Her chief concern was that she hated to smile for pictures because her front teeth were not well-aligned. She occasionally had soreness on the right side of her jaw and stated that she clenched and ground her teeth at times. Because of her line of work, she had limited flexibility for appointment scheduling and wanted to accelerate the treatment. AcceleDent was incorporated at the initial delivery of aligners. The patient noted that any discomfort related to her teeth moving usually subsided when she used the device. Diagnosis: Upper and lower crowding, asymmetrical bite, Class II on right, Class I on left, lower midline deviated to the right. Class II elastics, no IPR, posterior distalization on right. Significant improvement of alignment and bite correction to Class I. Lower midline still deviated to the right. Patient very satisfied with progress. #19 extracted because of recurrent decay under crown. Bite corrected to full Class I. Patient very satisfied with treatment results. Estimated treatment time without vibration technology: 35 months. Actual treatment time: 17 months. A 65-year-old patient came to my practice after going to several other orthodontic consultations where every doctor recommended surgery to correct his anterior crossbite and spacing. The patient had no interest in any treatment option involving surgery. Based on my experience with Invisalign, I believed that I could achieve a favorable result for him without surgery. 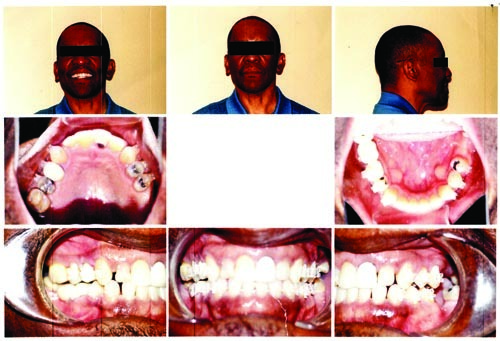 About four months into treatment, the patient noted that he wasn’t happy with his progress and that he wasn’t sure that his teeth were moving. Recognizing that his motivation declined, I recommended that he use AcceleDent. 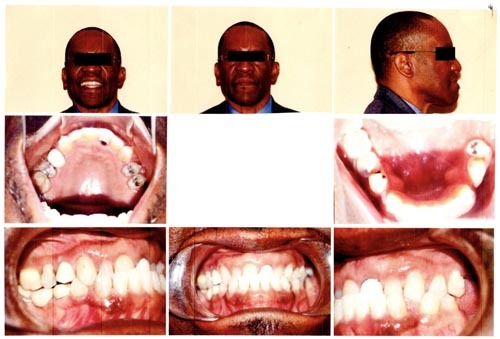 He was previously changing aligners every 14 days because of the severity of his case, but with AcceleDent he began changing aligners every seven days. 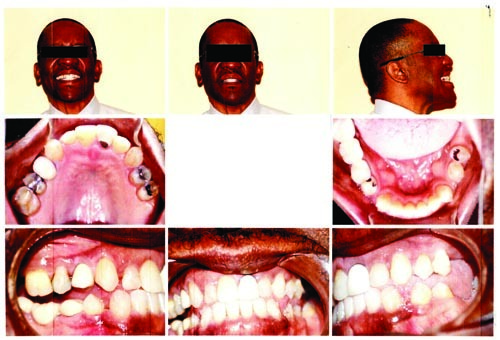 Looking at his case records, there is a noticeably significant difference in the amount of tooth movement we achieved in the first three months without low-pulsatile forces and the next three months with it. 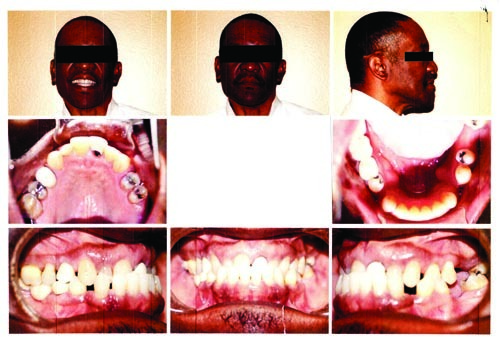 Diagnosis: Anterior crossbite, posterior crossbite, upper and lower spacing, crowns on several teeth that will need to be replaced at end of treatment. Mechanics: Invisalign and, starting in Month 4, AcceleDent. 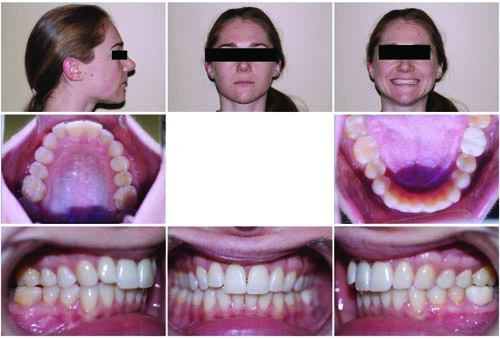 Eight-week appointments with two-week aligner changes. Space closure, upper expansion, maintain pontic space, no elastics. Small amount of space closure noted; no change in bite. Patient motivation low, because of lack of noticeable progress. Incorporated use of AcceleDent for 20 minutes a day. 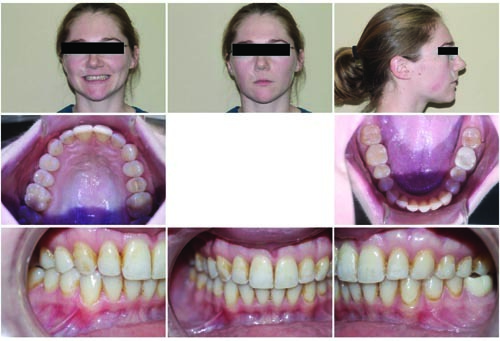 Ten-week appointments with seven-day aligner changes. Significant 5mm bite jump—anterior crossbite improved. Unwanted posterior open bite noted on right and left. No contact of posterior teeth. Bonded brackets and started vertical elastics. Aligners sectioned and worn on upper and lower 2–2 only. Dr. Heather Brown, a graduate of the University of Southern Mississippi, earned her Doctor of Dental Surgery degree at Meharry Medical College and her specialist certificate in orthodontics at Howard University, where she graduated as class valedictorian. 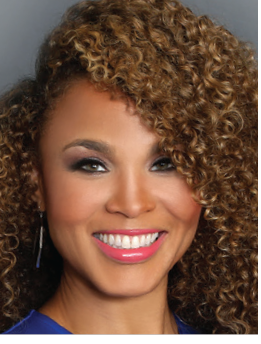 Brown’s community achievements have not gone unrecognized; she recently received the Community Angel Award from Houston Woman Magazine and was featured as a 2018 Top Dentist in Houstonia magazine. Brown’s clinical skills have landed her in the top 1 percent of Invisalign practitioners in the nation, but she says her crowning achievement was when she founded the Houston chapter of the Smile for a Lifetime Foundation, a national nonprofit that provides free orthodontic services to disadvantaged children.